Teledyne DALSA releases the BOA 200 a higher-performance addition to the BOA family of Smart Camera products. "Pumped up" with a 1.2GHz dual core processor, the BOA 200 offers excellent price/performance for applications that demand higher speed or higher resolution processing. Resident software, accessed via a web browser interface, eliminates the need for in-plant software version control. BOA 200 is packaged in a small rugged enclosure that fits easily into existing production lines, machinery or moving equipment. The product can deliver over four times the processing speed of the standard BOA camera and provides additional memory for both program execution and solutions storage. BOA 200 offers a flexible inspection system that is ready to setup, easy to integrate and quick to deploy on the factory floor with a choice of application software embedded. BOA 200 software variants include iNspect Express, IDR and Sherlock. All three software packages include a comprehensive suite of tools and capabilities, as well as support for standard factory protocols such as EtherNet/IP, Modbus and ProfiNet. The BOA camera line includes a range of resolution and performance models for both monochrome and color applications. The products are offered with panel ready accessories that provide integration convenience and expandability. 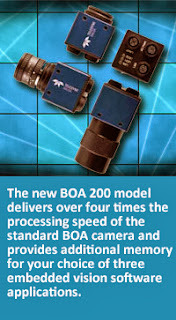 BOA cameras can be deployed across a diverse range of applications and industries.